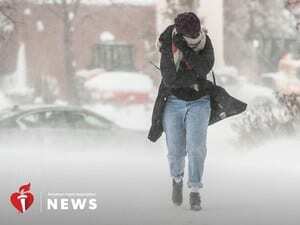 THURSDAY, Jan. 31, 2019 (American Heart Association) — Overexertion with a snow shovel isn’t the only cardiovascular risk during the winter. When temperatures go down, the incidence of stroke — the country’s fifth-leading cause of death — appears to go up. There’s no shortage of conjecture about why cold weather and strokes may be linked. Lackland said cold temperatures can constrict blood vessels, which raises blood pressure. It also can thicken the blood, which can lead to clots. In the Northern Hemisphere, cold months include the holiday season, which can mean stress and unhealthy habits like eating and drinking too much. “I don’t think cold weather is completely independent of other risk factors,” she said. Statistics show we can’t just blame the weather. Stroke mortality rates in the U.S. are highest in the Southeast, which is warmer than much of the rest of the country, but where people tend to exercise less, have higher rates of obesity and smoke more. “It’s clearly not just the temperature,” Lackland said.